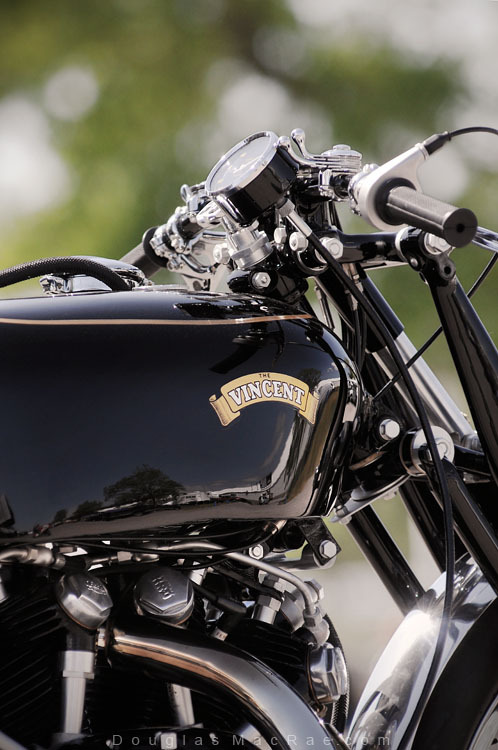 Vincent owners have always maintained close relationship with their ride and numbers of those bikes got a nickname along the road or the track: “VinnyLongLegs,” “Sir Lancelot,” “The Fast Lady,” “Nero,” “Mighty Mouse,” “Epimetheus” are among the most famous, but the list goes on. There is always a story behind, a story that sometimes resonates only to its owner. 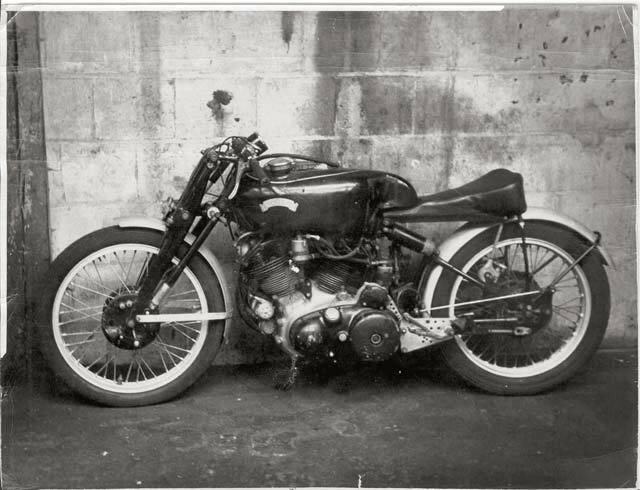 So what is the story behind “Gunga Din,” the factory test bed, which nickname was given by Charlie Markham, just after Motor Cycling magazine published a road test in its November 13, 1947 edition? We will come to that, but let’s start by the beginning, as Philip Vincent and Chief Designer Phil Irving decided to hand off a “rejected” stock Rapide Series B to the Experimental Department managed by the famous work’s pilot George Brown. Looking under that angle, it looks already as a sacrifice to the God of Speed and that the destiny of this mule was to stay in the shadow of the other Vincent, serving the case unconditionally, so the Vincent would remain the best among the best. As the only factory prototype, Gunga Din bear every development step for the production and racing purpose and endured the best as well as the worse. In fact, nobody can tell how many times its engine blows up, but employees’ testimony reported it happened several times. Archive pictures show that the original specification quickly and constantly evolved during its active life: new crankcases, heads and virtually any engine component were fitted to repair or upgrade Gunga Din. Similarly, the rear frame member (RFM), tank, seat and wheels were changed while the prototype of the Girdraulic replaced the old Brampton. 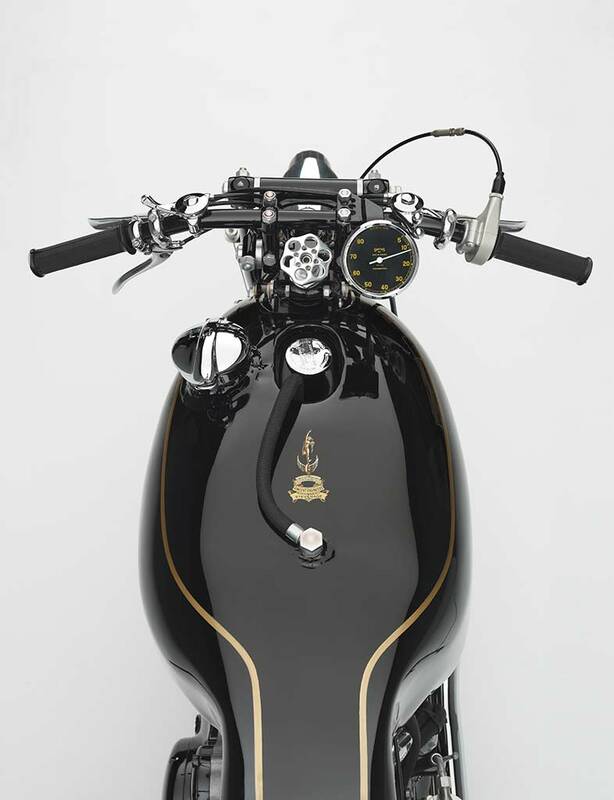 Therefore, it is fair to say that the 1952 bike has nothing to do with the original 1947 Rapide Series B, but was simply a specification frozen in the time with numerously experimental parts fitted on it. 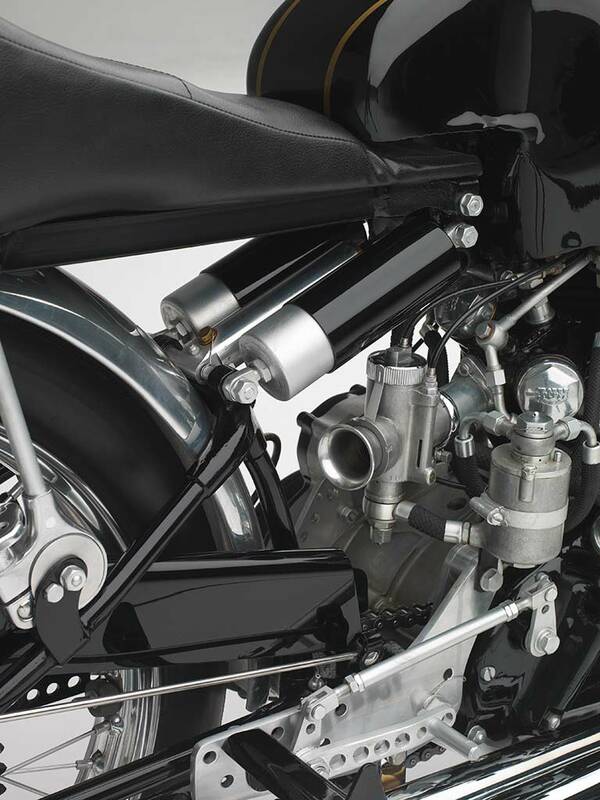 The very first key milestone involved enlarged ports, bigger carburetors, increased compression, polished con-rods and rockers, which moved the power from 45hp to 55hp; it was virtually what would become a year later the legendary Black Shadow. 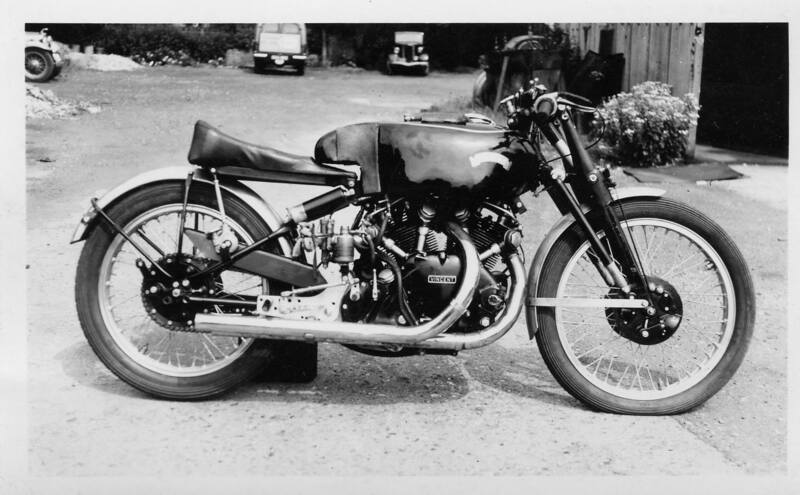 Historians of the brand admit that further development on this bike led to the Black Lightning specification, including the racing Mk II cams fitted on Rollie Free’s Black Shadow for the Bonneville speed records in 1948 (1). 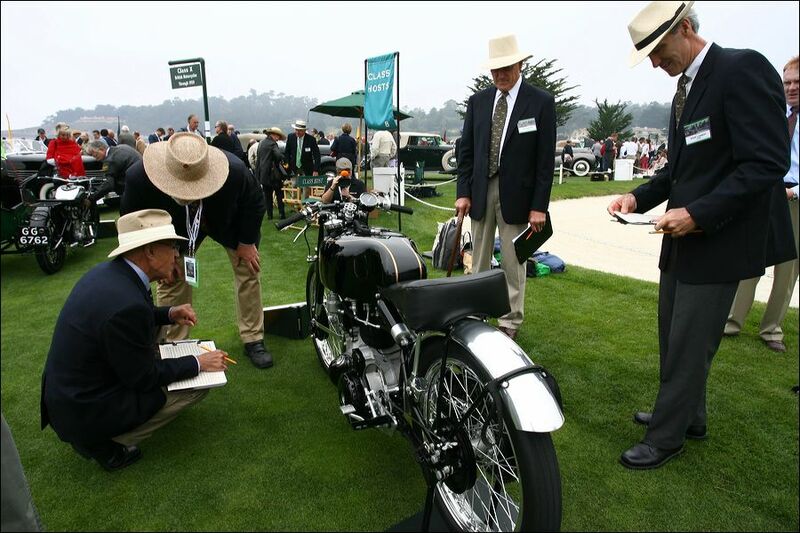 Exceptional situations often contribute to building legends like during the 1948 Clubman’s TT race. 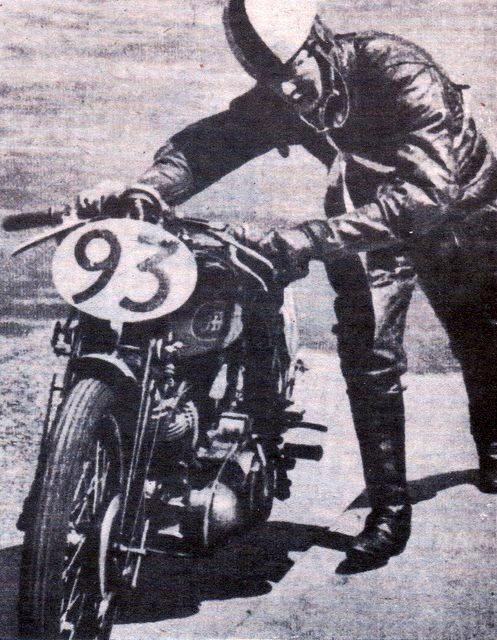 George Brown set the fastest lap at 86.25mph although he finished 6th, but this was after having pushed Gunga Din for the last 6 miles of the 37 miles race, simply because he was running out of gas! It was a short moment in the limelight as Gunga Din destiny was to be a mule. Even during the month of May 1952 where Vincent came at Montlhéry to collect eight endurance records, Gunga Din played that role. Indeed, the official pictures were made with one of the four nearly stock Black Shadow that were brought to the event. 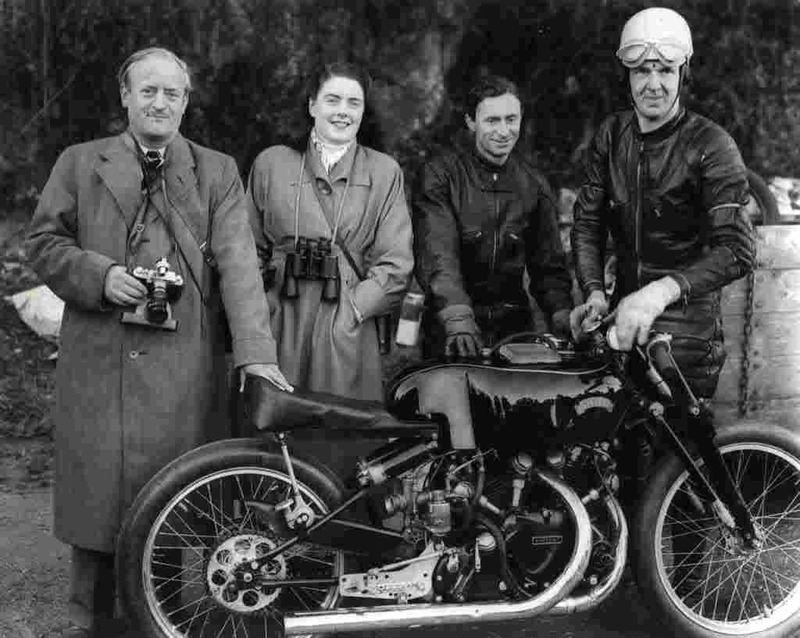 There was nothing special to hide as all seven bikes were built with the same engine specification by Ted Davies, but a stock Shadow was preferred to Gunga Din that was modified to fit eleven very different riders’ morphology (2). When the factory closed its door in 1955, the focus on performance improvement was already gone, and Gunga Din was just part of the past. The business was eventually taken over by a subsidiary of Cope Allman International and Gunga Din left behind. Was it discarded or hidden to preserve it from a risk of disposal? We will never know, but according Bill Wood (3), it was not before the early 60s that Gunga Din was found under sacks in an advanced corrosion stage, front wheel missing, in one of the outbuildings on the grounds of the factory. It was under the initiative of some Vincent enthusiasts, who were allowed by the realty owner to search for any remaining historical traces of the production in the buildings before the destruction of the site. A standard Shadow wheel was quickly fitted, and the bike offered for sale and purchased by Tom Pelkey, who exported it to America. Eventually, Garrett ran out of money for his project and Keith Hazelton, stepped forward to pursue Garrett’s mission. Hazelton succeeded to gather a quite large percentage of the original Gunga Din parts, especially the one stamped “EX” for experimental and he kept them in boxes for nearly 30 years. Then the history was going to accelerate as Paul Pflugfelder heard about Gunga Din project and he purchased the basket case in April 2009 to undertake its restoration. 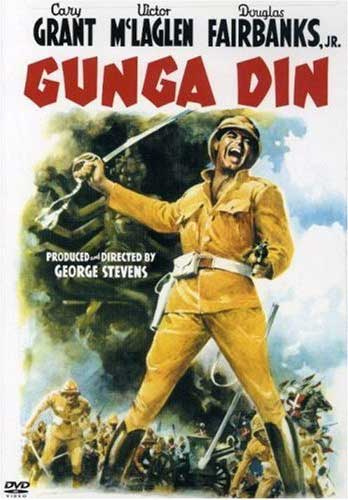 Finally Gunga Din was sold to the famous Canadian and Vincent enthusiast, Bar Hodgson who still own it. If you are not familiar with the Vincent history, you might still ask yourself: why this strange nickname “Gunga Din” was given by Charlie Markham? “Gunga Din” was one of Kipling’s poems that tell the story of an Indian water-bearer saving his military superior’s life, this latest declaring to him: “You’re a better man than I am, Gunga Din!” According Robert Smith (4) this was in recognition that the bike that Markham tested had capabilities that far exceeded his own. 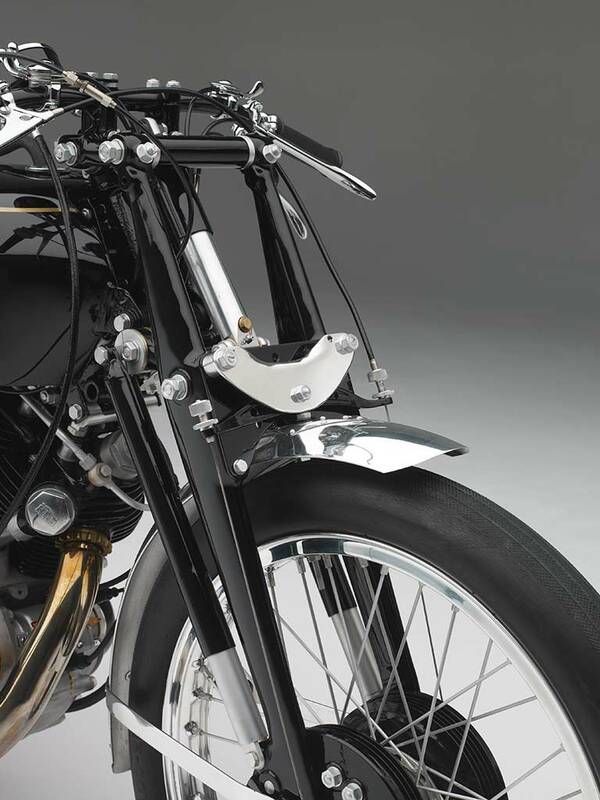 As a mule and as a water-bearer would do on a battlefield, this bike played in the background a critical role for success of the development of the twin Vincent and its enhanced performance. But “Gunga Din” was not an ordinary water-bearer; he was a man who would have suffered any sacrifice to save his master’s life, just like this mule did by enduring the best and the worst to make the Vincent one of the best motorcycles ever made. Its contribution would have remained unknown unless someone who witnessed how great and important its role was, would tell the world about it. Who better than a journalist could tell such story? The story of the bike having the makings of a hero, and soon to be named “Gunga Din”. Thanks to a few fierce enthusiasts named Gerrish (5), Garrett, Hazelton, Pflugfelder and Hogdson, Gunga Din is now in the limelight after 60 years of darkness; a well-deserved retirement for a nickname that was duly won and honored during its duty. Gunga Din’s life began as a “rejected” 1947 Rapide allocated to the Experimental Department to become the factory mule. It was used to develop the Black Shadow and Black Lightning specifications. Born as a Series B, Gunga Din will receive many upgrades during its duty such this Series C RFM. Hogdson has the original seat, which couldn’t be fully restored, so a duplicate was made. Unusual view that outline its unique tank. A dent made during the Montlhery record was left on the tank to preserve its authenticity. The original Brampton fork was soon replaced by the prototype of the Girdraulic fork. One of the characteristics of Gunga Din is that the latest crankcases were Die-Cast type (Series D) with no identification numbers. 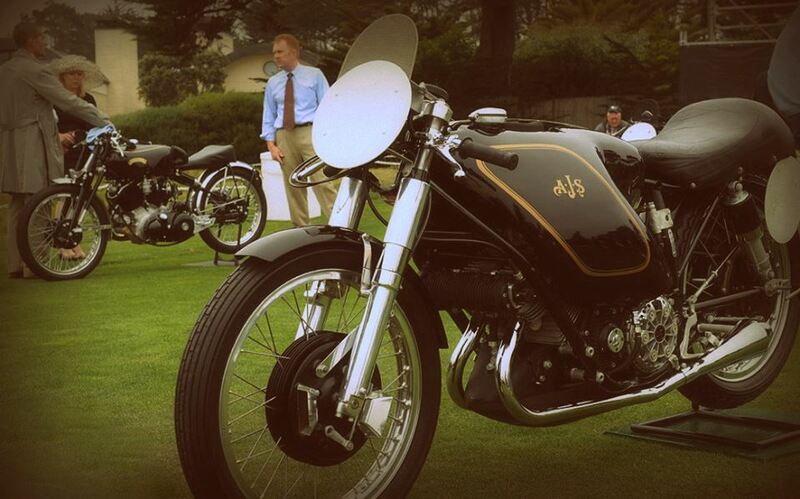 At the 2009 Pebble Beach Concours d’Elegance, Gunga Din (background) finished second in judging behind a rare AJS Porcupine factory racer. A contender that George Brown could have faced on the track back in their days. 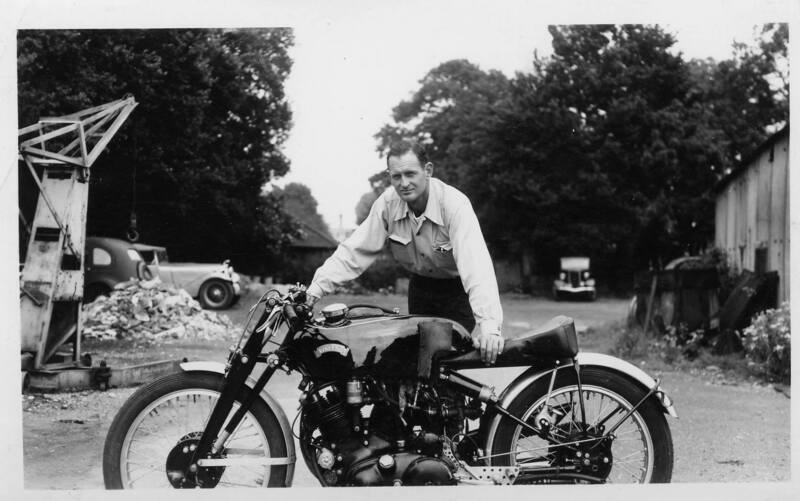 Bar Hodgson, producer of the annual North American International Motorcycle Supershow in Toronto, founder of the Canadian Motorcycle Heritage Museum & Hall of Fame and proud owner of Gunga Din. When he bought the bike, Hogson committed to bring it regularly in classic bikes events for the pleasure of everyone. George Brown and Gunga Din in an earliest specification. 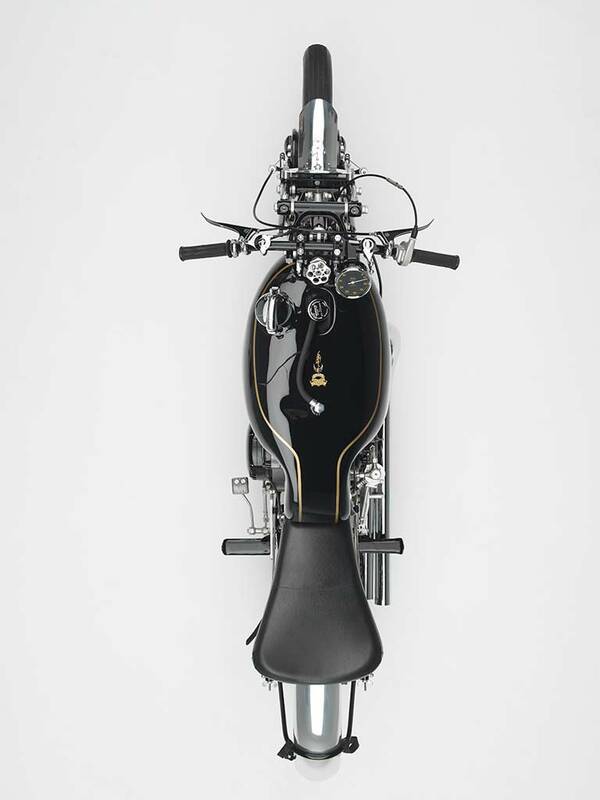 The very first key milestone in its development involved enlarged ports, bigger carburetors, increased compression, polished con-rods and rockers, which moved the power from 45hp to 55hp; it was virtually what would become a year later the legendary Black Shadow. 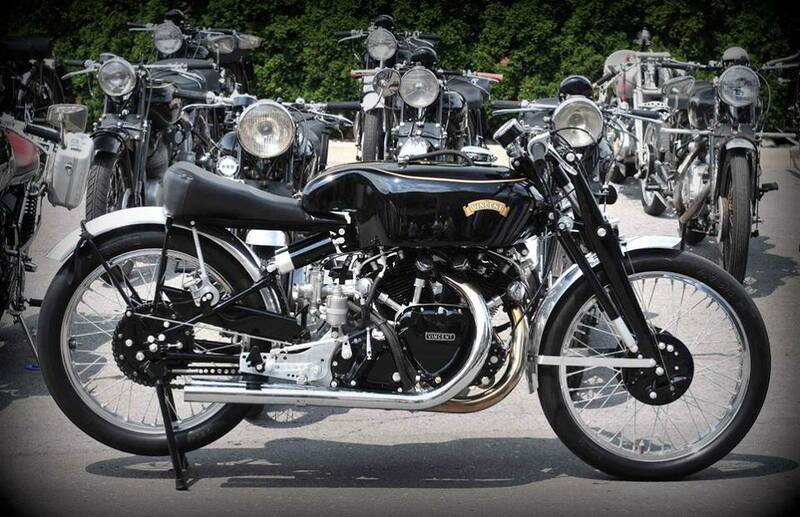 Looking at that picture, with its black engine and its Brampton fork, Gunga Din has already the appearance of JRO 102, the first production Black Shadow made in 1948. 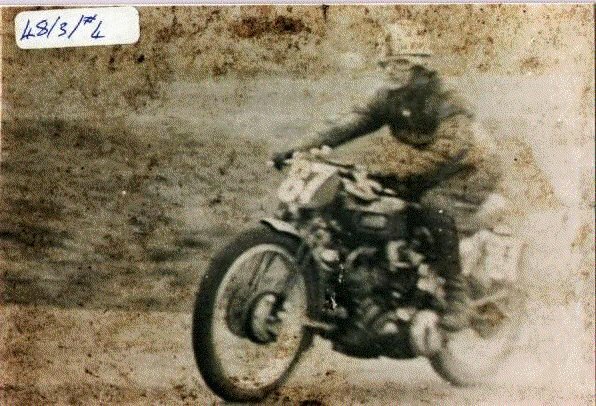 Legends are often made of extraordinary events like this 1948 Clubman’s TT race, where George Brown set the fastest lap at 86.25mph although he finished 6th after having pushed Gunga Din for the last 6 miles of the 37 miles race, simply because he was running out of gas! 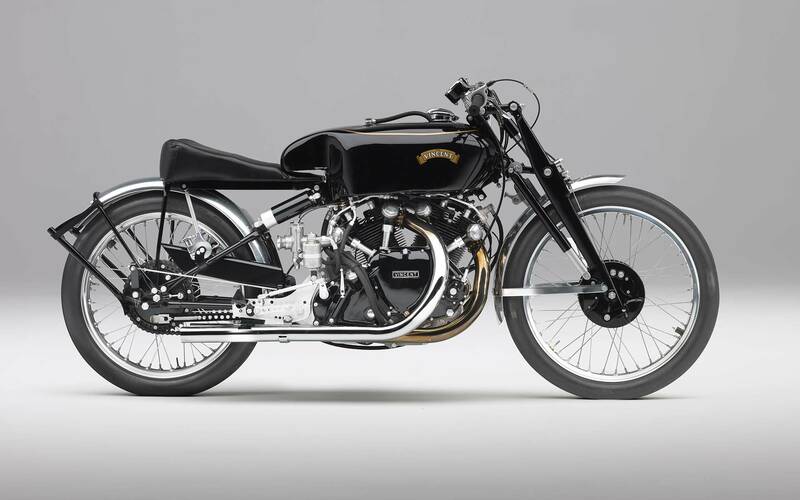 The current spec has the rare Vincent racing magneto, the prototype Girdraulic front forks, 32mm Amal TT carburetors, original 50-year old Dunlop tires, straight exhaust pipes with 2-inch headers and many one-off components. Everything has been lightened and drilled, with magnesium being used on various components including the brake drums. My preferred picture that I really love! 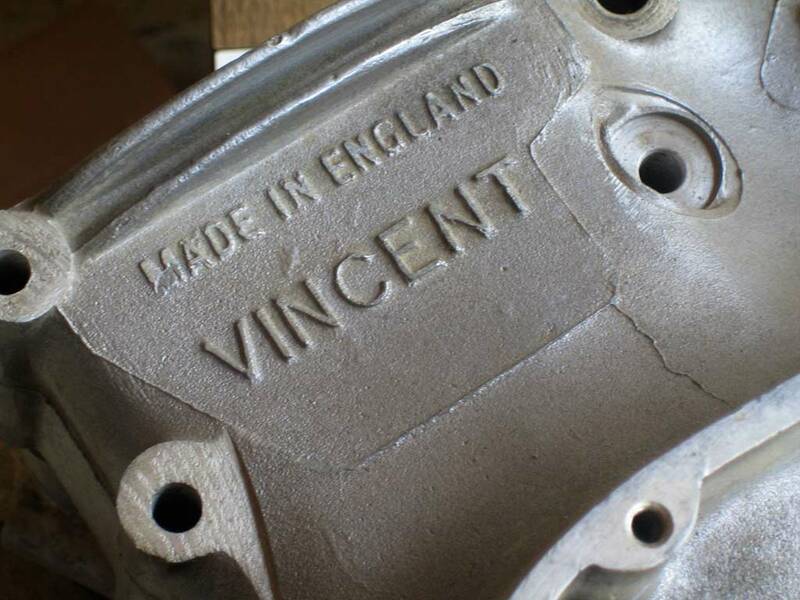 It looks like the stock production Vincent is doing homage to “Gunga Din” in recognition of its exceptional services. 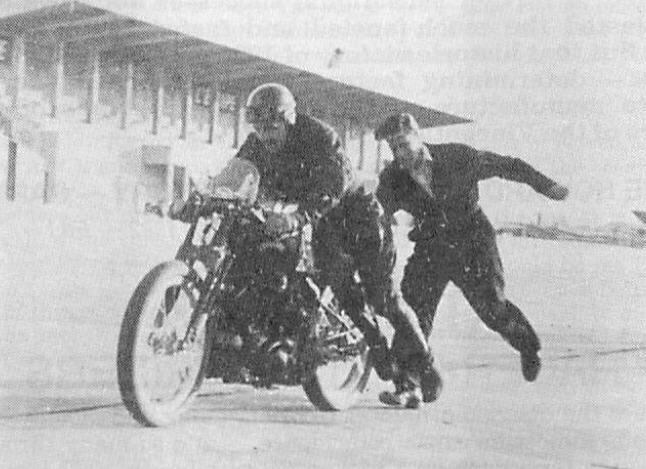 Ted Davies on the Lightning, gets a push off from Jack Lazenby, during the Montlhery record attempt. This picture supplied by Ted Davies himself shows that the record bike is indeed different from the official pictures (no headlight no mudguards…). One of the last shot of Gunga Din. Note that the machine has the latest unpainted die-cast crankcases. Gunga Din has been reassembled to this exact latest specification. (5) The late Peter Gerrish also has some credit in this story because Peter tried desperately to save the bike before it was sold to Pelkey. Peter was helping out at the factory premises cleaning up (Harpers) and began to organize a pile of boxes and tarps. Under the clutter, was Gunga Din. Harpers put a price of 250 Pounds Sterling on it, and Peter tried desperately to buy it. He only had 100 Pounds, so he contacted every member of the Club that he knew. No one would split it with him. He did not necessarily want to own it, but he felt at a minimum, it should not go out of England. A while later, Tom Pelkey bought it. Peter wrote about this in MPH | Information David Dunfey. 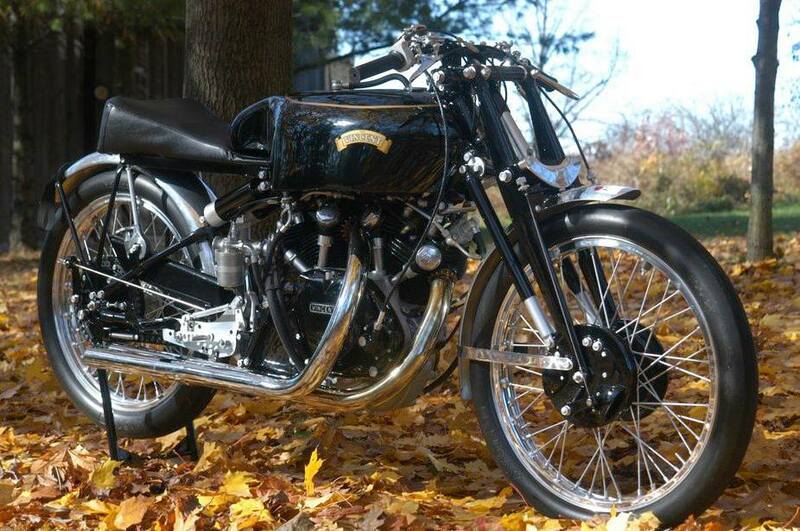 Next Could this Vincent 1360 Roadster be the ultimate modern Vincent? Thank you ! Absolutely wonderful blog, great photos !